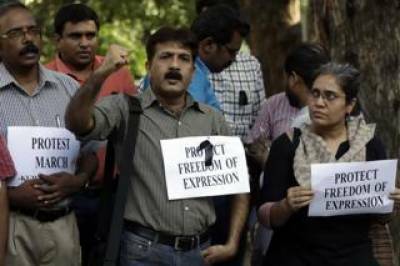 NEW DELHI - On Sunday night, police officers in Kerala’s Varkala town allegedly assaulted journalist Sajeev Gopalan and stripped him in front of his wife and 15-year-old daughter. Gopalan, 49, says he was targeted because of a story that he had done against the police a few months ago. The case is another reminder of the challenging conditions in which many journalists in the vernacular media work. This month itself has seen a spate of such attacks. Two days after Kannada journalist Gauri Lankesh was murdered near her Bengaluru home on September 5, two bike-born assailants shot dead Pankaj Mishra, a journalist with Rashtriya Sahara in Bihar’s Arwal district. On September 20, television reporter Shantanu Bhowmick was abduced and killed in Tripura while covering a political demonstration. Since 2015, as many as 142 attacks against journalists have been registered in the country, according to the latest data available with the National Crime Records Bureau (NCRB). As many as 70 journalists were killed in India between 1992 and 2016. Many of them were independent journalists who were murdered close to their home or their workplace. The alarming frequency with which journalists are being attacked gives rise to a number of disturbing questions. Why do attackers —politically motivated or otherwise —believe they can get away with attacking journalists? One reason could be the absence of a deterrent and a lackadaisical justice system. According to international non-profit Committee to Protect Journalists, not a single journalist’s murder in India had been solved over the past decade. The State needs to ensure stringent punishment for the perpetrators if a journalist is assaulted or intimidated in connection with the performance of duty. A few years ago, disturbed with the flood of attacks against journalists, the Press Council of India had recommended making this a cognisable offence punishable with a five-year prison term. But nothing came out of it. That appears to be part of the problem. Many recommendations of the Press Council don’t see the light of the day. There is a case for introducing a regulatory body with a robust redressal mechanism for journalists who are intimidated or attacked. This is the least that can be done for journalists who put their lives on the line while doing their duty.